Talk to my parents on any given day and they will tell you that I came out of the womb SCREAMING. Talk to my siblings on any given day and they will tell you my whole childhood up until I left the house at 19 I continued SCREAMING. Talk to my neighbor on any given school morning at 7:30 a.m. and she will tell you I am SCREAMING. Is it right to SCREAM? No. Is there a reason I do it? Yes. Maybe I came out of the womb screaming because I love a good entrance. Maybe I screamed my whole childhood because I was the last of five children and no one would ever let me get a word in edgewise. Maybe I scream nowadays because my children (OR HUSBAND) either don’t hear me, don’t listen to me or guess what; maybe I am just totally stressed out with my life of juggling 8 kids under 8, a job, a house, endless laundry, meals, diaper changes, cleaning, homework and “etc., etc., etc.”. Regardless of why I scream I am always trying to change myself for the better even if it doesn’t appear that way. People may think I am prideful because of my killer confidence but actually, in reality, I am hard on myself. I don’t like it when I scream or lose my cool but sometimes it happens and after it happens what people may not see or here is the makeup sessions I have with my kids. I apologize, they apologize, and we laugh, move on and start over again. One day it did dawn on me though, gosh, you know what, for 10 years I have lived basically 10 feet from my neighbor. For most of those 10 years my husband has been embarrassed by my screaming. It’s bad enough that I scream inside the walls of my own home but bear in mind that since I am perpetually nursing or pregnant I am always hot due to the hormone fluctuation. With that said it could be the polar vortex here and I will still have my windows open. So now my poor neighbor has to hear me like, in stereo. So when it hit me and I really thought about it I thought, oh poor Linda and Brian! And I made an effort to change that day. The first day I blew it once. The second day I almost blew it. And then, that afternoon I decided to go shopping. This was ONLY FOUR days ago. I went to my favorite store to go shopping for a dress for an upcoming wedding. I decided to also browse the men’s aisle for Christmas presents for my hubby. And then I saw it….staring at me….from the depths of the dusty shelves all covered with useless gifts. Its appearance was IMMEDIATELY recognized. Flashback to years past when we used to take the children every year to a Corpus Christi procession at our Church. We went through the streets in a procession while praying the rosary. Because there were hundreds of people the only way that we could hear the leader of the rosary was because he had a megaphone. All at once upon spotting THIS GLORIOUS CREATION I fell to my knees, crumbling on the ground with tears of joy and arms wide open longing to embrace that sanity which only cost $12.99. Chills went up and down my side and I just knew. I knew that my moment of screaming had come to an end. VICTORY. SANITY. I was shaking. I pulled myself up from the floor and touched it. I flipped the switch from off to on, from silent to loud, took one deep breath in and one long breath out and, in the aisle of Ross Dress for Less, for all to see and here I said one thing: THANK YOU GOD, I AM SAVED! Make no drama about it; this was indeed my very salvation. As the persecutors looked on I switched the button to off and slowly and ever so gently wrapped the megaphone in the cashmere sweater that was in my cart. At that moment, I was Gollum and it was my precious. At that point I could no longer think straight. I had to get home so I left and scurried home all excited to show the family. I made my entrance into the home saying, “Diaz, Diaz, please report to the car to help Mom with her bags!” And well, if I was excited about it you can only imagine how excited the 8 little kids were! They thought it was the best. My husband looked over at me and his look was priceless. It was half: OH GOOD LORD and the other half: OH MY, I think she’s got it! I just shrugged the first part of because in my heart of hearts I knew that this item and I were meant to be together FOREVER. That was Sunday so I could barely sleep thinking about Monday morning. Ha! It was hysterical because one of my sons, who normally wakes up first, would not come upstairs. I finally went to get him and he was all wide awake and disappointed that I had not woken him up with the megaphone! Ha! So we proceed with my morning routine and I am all proud that I have not screamed. I just kept thinking I hope Linda (the neighbor) is sound asleep! Then it was time to go. This is where normally the screaming begins. So I called the children. Nothing. I called them again nothing. Mind you they are 10 feet from me. I get the itch to scream and think that this is the moment I have been waiting for. Here goes the test. And with that I grab the megaphone and I say, “Diaz children, it is time to leave” to which, like robots, they immediately jump up, shut the TV off, and go to the car. OMG! Where have you been all my life, beautiful?! As I kissed the megaphone. The rest is pretty much history. I kid you not, I have not screamed since Sunday. First time in 38.25 years. 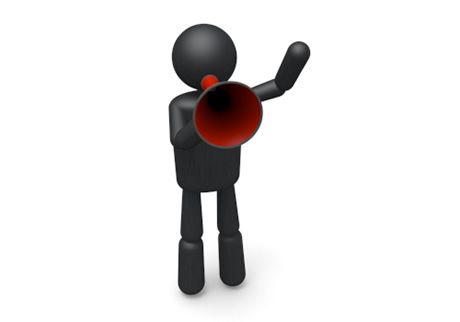 Whenever I get the itch, like a recovering addict, I anxiously look for my megaphone and the problem is solved. This goes for conversations with my husband too! So, do you want to be heard? Do you want your spouse or children to listen to you? Do you want to give up screaming for good? Enjoy your children more? Save tons of energy that you will feel given back to you and which you then in turn can give that good energy to your spouse and kids? THEN GO OUT RIGHT NOW AND INVEST IN A MEGAPHONE. Satisfaction guaranteed or I will remove this blog! So far I am due to buy my Mom one and my BFF. Hurry and get yours soon because once I become famous there may be a shortage! Oh and just remember to buy extra C batteries because they last thing you need is that beautiful little baby dying on you when you need it most! Blogger’s note: some of the stories in this blog have been altered for maximum enjoyment. Oh, and there is drama and exaggeration…like the salvation part. Only Jesus is my salvation! Amen! 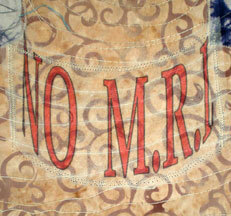 Just say NO to MRIs and YES to childbirth! So yeah…ok, I kinda had to/”wanted” to get an MRI. No biggie or so I thought. It was all very simple, to get an MRI to just KNOW, ya know or to NOT? Well heck yeah, get er done! So that was literally the end of the conversation…until I got to my appointment. So the lovely lady comes back immediately and escorts me to the beautiful white room. Keep in mind that with all the drama this all happened within 5 minutes or less of my scheduled appointment. I get to the room and another person, a man, greets me. Here is this beautiful long place for me to lay complete with comfy pillows. They tell me to lie down and so I do. I am expecting them to tell me to strip because medically speaking I have for the last um 9 years due to my pregnancies but JOY they do not, I can be in this grand dwelling with medical clothes on! WOOT! I joked with them and said that no matter what I do I cannot get away from these ugly scrubs! I then told them that I had 8 babies within 9 years. After the WOWs and whatnots, they begin to chat with me at rapid speed so I am thinking they must be busy and want to get out of there for Halloween. I inquire to which they explain they are always on time and they go until to 6 pm. Sweet! I love people who are on time! The next thing they do is put an IV in me. Oh joy. You would think I was a druggie by the way I directed the guy to my “good” veins. I reminded him, “8 kids in 9 years – trust me I’ve been pricked like crazy!” to which he chuckled. They explain that I will be given earplugs because of the noise and that they will talk to me through the whole duration, that I have something that I can click if I need anything and then that I will be asked to hold my breath many times. Then they put this big thing over my stomach that weighs heavily on you and basically they shipped me on my way, literally. So there I was moving…somewhere, but where? I was thinking, “oh, ok, well what next? How long does it last? Wassup?” I did not ask any questions because, as with typical Doc appointments I thought who cares, the sooner I get home the better. So in I go to the “machine”. Dang, I don’t know what that thing is but it is SCARY like CRAZY SCARY. I just kept thinking of when I make cakes with the kids and I squeeze icing through that tube thingie – yeah that was me. Take a super large woman who can’t ever sit still or have her mind stop going a mile a minute and put her into that type of thing = NOT FUN. So slowly I am pushed through this THING… At one point they stop. SILENCE. Yeah, you got it, like SCARY SILENT. I open my eyes and it’s white; like white IN YOUR FACE an inch from you white. I close my eyes and that’s scary too because I never close my eyes, not even when I sleep! Ha. (Just kidding) If ever my eyes shut it’s because I crash from exhaustion so I don’t have time to be scared. So at this point, eyes open or shut in this white pad I’m scared either way. I’m thinking is this what hell is like? Then I think no, because it’s white, too nice, silent and comfy because after all I was in a good place, alone, without anyone screaming. I just clearly do not know how to sit and be still (and well, KNOW GOD, as the passage goes). So, NO, not hell fo sho. Is this purgatory? Maybe only because purgatory is a place you don’t wanna be. But then again I am content to be alone in this place. I almost feel like I am being swaddled (because I can’t move) and again, there’s no pain, no screaming. And the weight from that thing on my stomach is actually making me feel like I have a flat tummy. SCORE! Is this Heaven? No, NOT heaven…just no. I mean if I had a choice of where to be – it would NOT be here. But then it was silence…like LONG silence. And then I am wondering what’s going on. Am I dead? Did the machine kill me? Where is God? Then I hear a computer generated person say what I think says, “BRO-THER” and then later, “HOLD YOUR BREATH.” I finally understand she means, “Breathe in” and the only reason I know that is because the nurse informed me that I was going to have to breathe in and hold my breath. Being in the IT field I just kept thinking that they need to get a better system to speak for them because she’s clearly not cutting it. At one point I could not even hold my breath because in my head I was chuckling at her stupid voice. Who are you, anyways? You enter into my world without a proper introduction. How rude! I’m thinking I’ll just call her Eva (from WALLE). So back to the breathing thing. I knew it was going to happen but really, peeps, you all should really have warned me ahead of time – like a week ahead of time so I could exercise and get in shape for this. I am a huge tired woman. Holding my breath and sucking my fat post-partum gut in for 30 seconds every few minutes for 15 minutes is like asking me to run a triathlon! UGH. Then, all of the sudden I hear the male say, “You are doing great, you will be done in less than two minutes.” Oh so now you chose to talk to me? You who told me that you would be talking to me the whole time? Yeah thanks buddy. Where were you when I needed you? You just wanted me for my scans. Shame on you! lol. Fast forward to getting home after trick-or-treating and I have to pump. OMG. Dat nurse was NOT kidding! This stuff is blue! What the heck is this? Oh, good Lord, no wonder she was freaking out. Yeah, so, I will vowed NOT to nurse until that stuff came out crystal clear like crystal springs if you know what I mean! Anywhoo, da moral of the story from me, the mom who birthed 8 kids in 9 years: I can handle pregnancy, I can handle the fear of labor and delivery, I can handle a C-section, I can a minor amount of UNMEDICATED labor, and I can handle medicated labor and delivery BUT an MRI, NEVER AGAIN. You couldn’t pay me enough to back to that place. If I want silence, or to wear ugly clothes or to get pricked with IVs I can get all of that taken care of at my annual trip to deliver my baby of the year. But being afraid? Fearing for my life? Being shot at? Running a triathlon? Yeah, no thanks cuz I need not leave my home for any of that. But I will take the ear plugs (thank you very much). So…yeah, just say NO to MRIs and YES to childbirth!